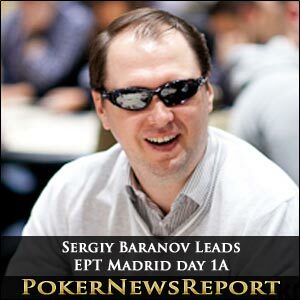 EPT Madrid Day 1A Sees Sergiy Baranov "Muy Feliz"
Sergiy Baranov was the happiest man in Madrid last night, finishing Day 1A of the PokerStars sponsored EPT Madrid Main Event with a handsome chip lead and a day off in the sun today (Martes/Tuesday). The Ukrainian, who has cashed in EPT Events in Copenhagen, Vienna, Berlin, Vilamoure and Barcelona, bagged up 152,500 chips at the end of eight levels of play – 10,000 clear of Romanian professional Anton Ionel, with a further 12,000 chip gap back to third-placed Efren Garcia Louzao from Spain. A Quiet Day at the Office Dear? Indeed, it was a quiet day by EPT standards, with much of the blame attributed to the PokerStars $6 Million Guaranteed Sunday Million for which many of the players scheduled to appear at this event missed Day 1A – in order to get some sleep before commencing their title challenge on Day 1B. Only 130 players registered for the initial day´s action and, by the end of the day, we had lost just 38 of them. Among those who we will not see back at the Main Event tables on Wednesday include JP Kelly, Roberto Romanello and James Dempsey – who inadvertently threw his mobile phone into a swimming pool and has now lost all his Cheltenham selections! Also soaking up the sun instead of playing poker on Wednesday will be WSOP final tablers Eoghan O´Dea and Martin Staszko, as well as Russian WSOP bracelet winner, Konstantin Puchkov – who had been fast out of the traps on Day 1A, but then ran into Señor Baranov. For most of the latter part of the day, Baranov and UK poker player Martins Adeniya held position at the top of the chip counts – Adeniya after busting EPT Loutraki champ Zimnan Ziyard with a beautifully played full house of Aces over Tens – and although Martins Adeniya slipped down a little in one of the last hands of the day when he ran into the Queens of Efren Garcia Louzao, he is still well placed with 95,000 chips to mount a deep run in the tournament. Other Brits who navigated a tricky first day include Chris Moorman, James Akenhead and Barny Boatman, who is hoping build on an impressive sequence of cashes at live events. Although it is unlikely that we will see the size of field that contested the EPT Madrid Main Event in 2011 (when it was the EPT Grand Final) Day 1B promises to see a considerably larger field involved in the action, with plenty of top names, keen PokerStars qualifiers hoping to become top names and a wealth of action. Keep up to date with what is happening at the PokerStars EPT Madrid with Poker News Report.